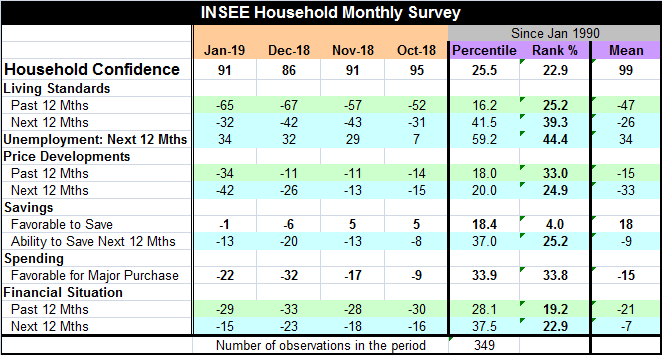 After forming a spike top in confidence in June 2017, French household confidence in the INSEE survey has been on a downswing. This month’s five-point rise in the index to 91 from a low of 86 (the weakest reading since October 2014) is the largest month-to-month rise in the headline index during this period of erosion. Over the last 29 years, the headline reading has been weaker about 23% of the time and stronger about 77% of the time. This is a very low reading for confidence in France despite the bounce this month. And the headline does set the tone for the report. There is no component with a standing above its own historic median. Of the ten components, six are in or below the 25th percentile of their respective historic queues of data. Living standards past and future improved on the month, but past standards have a 25.2 percentile standing with future standards are at a better 39.3 percentile standing. The expected future standings for the next 12-months improved sharply this month from a net reading of -42 to -32. That is the best reading since -31 in October. Unemployment expectations rose in January and that is not a good development. Still, the reading has only a 44.4 percentile standing and is below its median. Even so, this index has jumped from 7 as of October to 29 in November and has continued to snake higher. Clearly, concerns in France are rising and that is not surprising with all the protests in the streets. Price developments deteriorated for both the past 12 months and on expectations for the next 12 months. There was a sharp month-to-month deterioration for both series. Past price developments carry a 33rd percentile standing while price developments expected for the next 12 months carry a 24.9 percentile standing. Inflation has been and is expected to remain low. The environment for saving remains quite poor although it improved this month. Both the ‘favorable to save’ and the ‘ability to save’ reading improved month-to-month. But the ‘favorable to save’ response is lower only 4% of the time; it is quite poor. And the ability to save reading has a 25.2 percentile standing. There was a sharp claw back in the reading for ‘favorable to make a major purchase.’ But it had deteriorated sharply in November and December and is still below its November reading and well below its October reading. The category has a 33.8 percentile standing. The financial situation improved on the month for both the past 12 months and expectations for the 12 months ahead. Still, conditions are little-changed from what they were back in October. The past 12-months rank in their lower 19th percentile while the outlook is only slightly better with a 22.9 percentile standing. Not only is France struggling, but growth in the EMU area is challenged as well. Just yesterday with the ECB barely having stopped its asset purchase program, ECB head Mario Draghi said that the program could be turned back on if needed. Europe is going through a difficult patch and France is with it every step of the way.